The presidential candidate of the Peoples Democratic Party and former Vice President, Alhaji Atiku Abubakar on Wednesday appeared before the National Peace Committee convened by Gen. Abdulsalami Abubakar (retd) and Catholic Bishop of Sokoto Diocese, Rev. Fr. Mathew Hassan Kukah, where he signed the peace accord for the 2019 general elections. 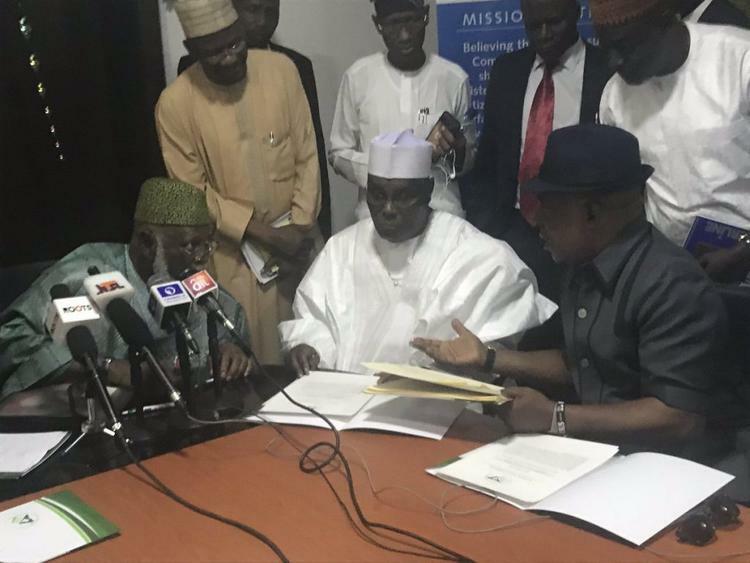 Speaking shortly after signing the peace deal, Atiku commended President Muhammadu Buhari for accepting to sign the accord, but also advised him to sign the Electoral Act Amendment Bill 2018. “I commend the President for accepting to sign the peace agreement. But let me also advise him to sign the Electoral Act Amendment Bill”, Atiku said at the event witnessed by many PDP stakeholders and supporters. Those at the event included, the PDP national chairman, Prince Uche Secondus; former governor of Ogun State, Otunba Gbenga Daniel; former presidential aspirant and former Minister of Special Duties, Alhaji Saminu Turaki (SAN). It was reported that on Tuesday, about 30 political parties protested against their exclusion from speaking during the NPC convened by Abubakar. According to them, granting only President Muhammadu Buhari the opportunity to speak during the signing of peace accord in Abuja was the height of injustice. The parties also protested the recognition of the national chairman of APC, Adams Oshiomhole at the event, saying the special treatment accorded them was discriminatory. The leader of the protesting political parties and chairman of Change Nigeria Party, Usman Ikeleji, said the committee demonstrated what he called “partiality” when it failed to also grant the chairman of Inter-party Advisory Council, Peter Ameh, the opportunity to give a speech at the event. “Why was only the presidential candidate of the APC (Buhari) allowed to speak at this occasion? Is Buhari the only presidential candidate here? Nigeria belongs to all of us. “Why should Oshiomhole be singled out at the event when we have equal status as chairmen of political parties? We came here and can’t be allowed to speak? Who owns Nigeria? It is our county. You can’t just bring us here and ask us to sign a document we don’t even know the content. These men are deceiving us.